The village of Westerham has evolved for more than 1000 years from “Doomsday and Pilgrims Way, to Motorway”, into the town it is today. Close to London and the M25, Westerham is privileged to be surrounded by woodlands and open space, and seems to be built on “on a hill in a valley”. 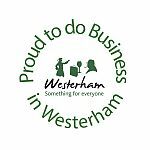 Over the centuries, a variety of talented and famous people have been drawn to live in Westerham. Their legacy is here for us to enjoy. Below are three of the best known…but there are more, see list below! Son of Westerham innkeeper Richard Frith, John Frith was educated at Eton and Cambridge and was appointed by Wolsey as a junior canon at Oxford. He helped to translate the New Testament from Latin into English. His reformist views were considered heretical and he was imprisoned in the Tower of London. At age 30 he was publicly burned at the stake as a heretic in Smithfield. St Mary’s contains the font in which he was baptised and a memorial window to him by Edward Burne-Jones. James Wolfe joined the army at 13 and became a celebrated army officer, famous for his leadership and the way he reformed army training. As General Wolfe he was victorious over the French in Quebec, Canada. Died in combat, aged 33, in 1759. The 250th anniversary commemorated in Westerham Wolfe Weekend in September 2009. Vist Quebec House where he lived and St Mary’s church to see the font in which he was baptised and Squerryes Court, home of his close boyhood friend George Warde. First Lord of the Admiralty during First World War. British Prime Minister during World War II and again in 1950’s. Lived at Chartwell with his family from 1922 until his death. As well as an international statesman, Churchill was also a prolific writer of books and an artist. Don’t miss the statue on The Green by Oscar Nemon and make time for a visit to Chartwell.